It was very muddy underfoot today which is not surprising given all the wet weather we have had this winter. We had previously hedge-layed along this track but the stumps had grown too thick for it to be viable any more. 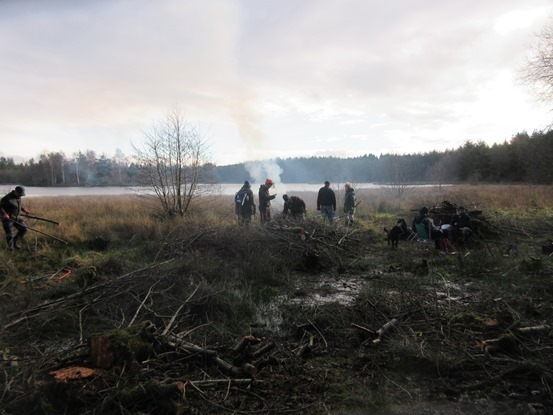 We also, gingerly, trod across the marshy area towards the lake to remove the stray birch and willow. One of our team had the misfortune to totally fill his welly with lake water but insisted that he got home before trench foot set in! There was a birdwatcher by the lake and he complained that the noise of the chain saw had scared away the Goosanders! We assured him that they would be back when we had gone. These handsome diving ducks are a member of the sawbill family, so called because of their long, serrated bills, used for catching fish. 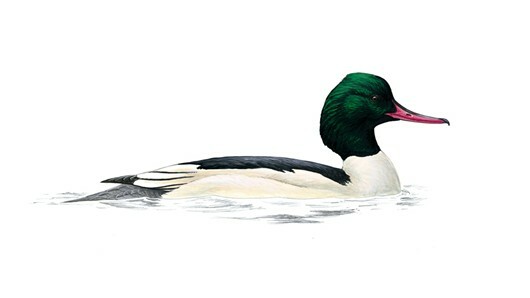 A largely freshwater bird, the goosander first bred in the UK in 1871. It built up numbers in Scotland and then since 1970 it has spread across northern England into Wales, reaching south-west England. This shows the team towards the lake. The larger willow was left for the birds to perch in during the summer. 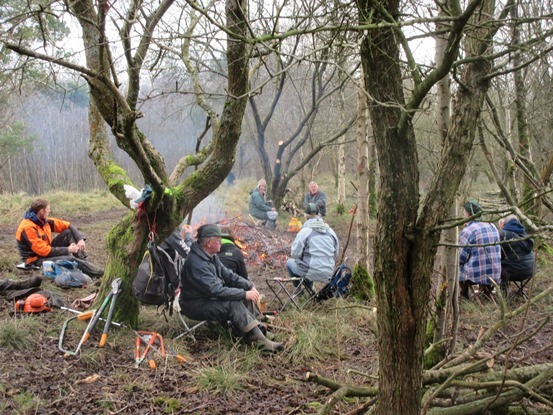 It was even more muddy underfoot today and quite a few of us got bogged down in the quagmire! 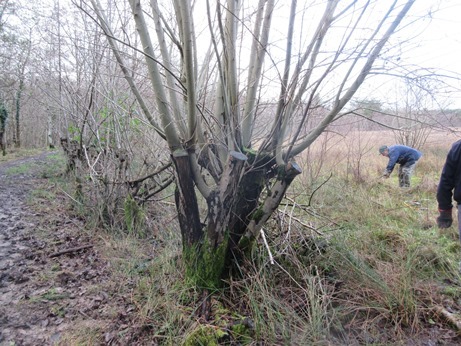 We were working on the east side of the lake clearing the willow and alder from the side of the stream. 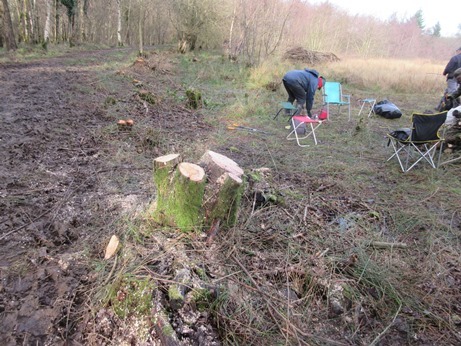 This was to improve the habitat for the dragonflies and, in particular, the Golden Winged dragonfly which is one of the largest dragonflies seen in this country. 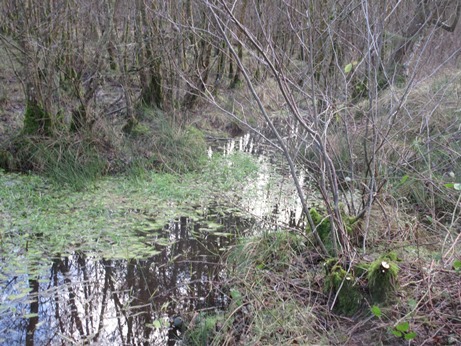 There are estimated to be about 20 different species of dragonfly around Woorgreen Lake and the larvae use this stream for up to 3 years before they become a dragonfly. --> The golden-ringed dragonfly is a very large dragonfly which is on the wing from May to September. It is a dragonfly of small, acidic streams in moorland and heathland and may be found away from its breeding sites. The female of this species is the UK's longest dragonfly because of her long ovipositor. Golden-ringed dragonflies are voracious predators, feeding on large insects such as damselflies, other dragonflies, wasps, beetles and bumblebees. They are fast, agile and powerful flyers. The team are removing the Larch and the Willow. 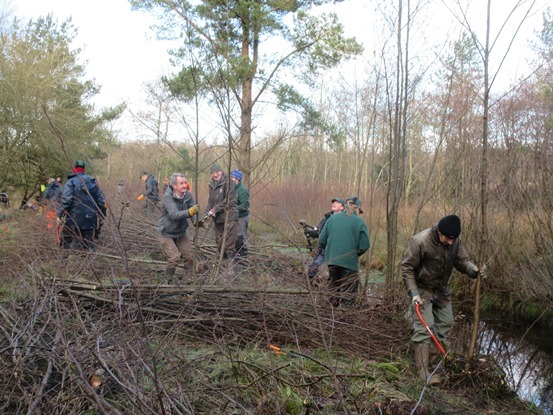 This is a repeat task as we last did it just over 2 years ago so most of the coppiced branches were not too big. Some of these larger trees were also removed.